As I have been walking around the mainly single-laned, cobblestone streets of Antigua passing signs such as “Our beer is as cold as your ex-girlfriend’s heart” and “Shots for 5 Qtzl,” I have been a bit perplexed. Had Antigua really just melded into a playground for young Americans or other drinking-inclined foreigners? The sign is actually pretty hilarious. We live next to an Italian-American; the guys we hang out with from school are German. The predominant language of the patrons in any restaurant is English, usually of the American or Canadian variety. 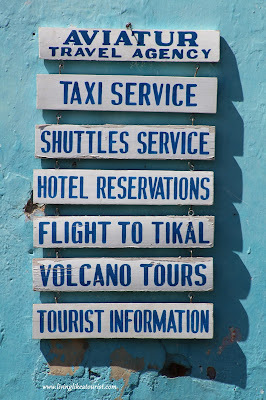 Aside from stores and restaurants, almost every other locale is either a Spanish school or a travel agency all offering the same tours throughout the country: Tikal, Lake Atitlan, Chichicastenango or a hike on one of the volcanoes. Was Antigua really just “Camp Guatemala” as one of our friends called it or did it have some authenticity that I was missing? I had to think about it closely, but I realized that yes, there is indeed still a very authentic Antigua and that I had more of it in my day that I realized. 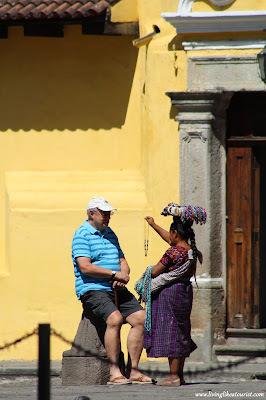 I am privy to 8 hours a day of one-on-one time with locals. 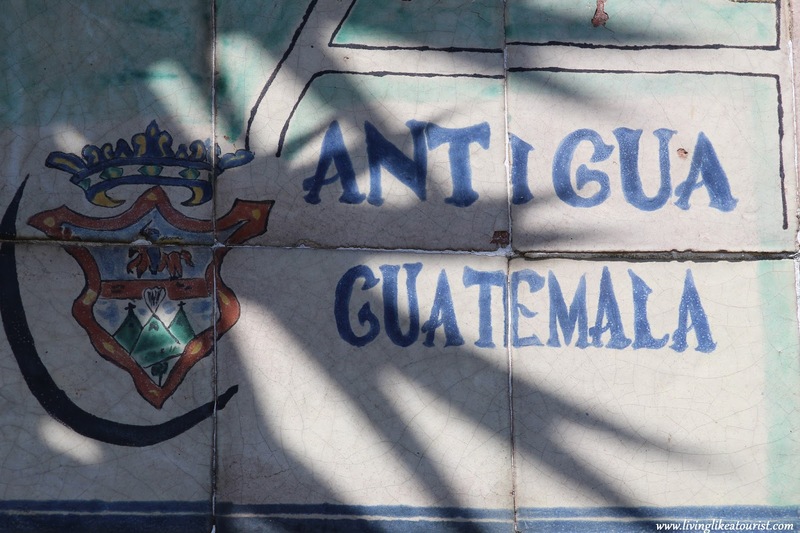 And yes, those hours a day are filled with Spanish lessons, but they are also filled with the stories of Guatemalans, whose own histories tell you more about the city than any guide or school book ever will. One teacher recanted her story of how her husband’s cousin was killed at 17 at the whim of drunk soldiers causing trouble during the time of the civil war. 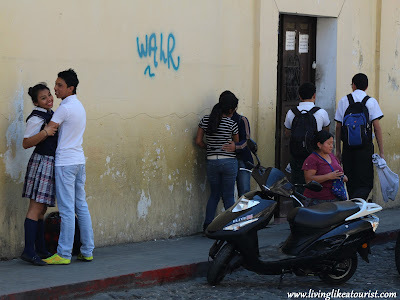 Another teacher told me of when her cousin, who was like a sister, went to the hospital for a kidney problem. The doctor entered the endoscope incorrectly and punctured her lung which never healed and that was what killed her in the end not the kidney trouble. 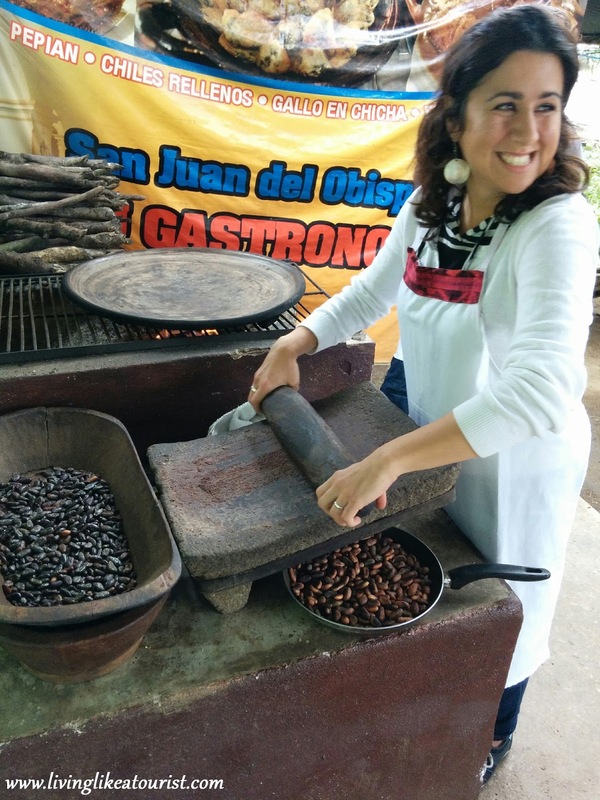 One of my teachers was so poor that on December 24th, they would go to bed long before midnight, like any normal night, because her family had no money for the traditional tamale meal, let alone for gifts, and she wondered why Santa did not love her. When do you ever get to meet locals who share these types of details with you? 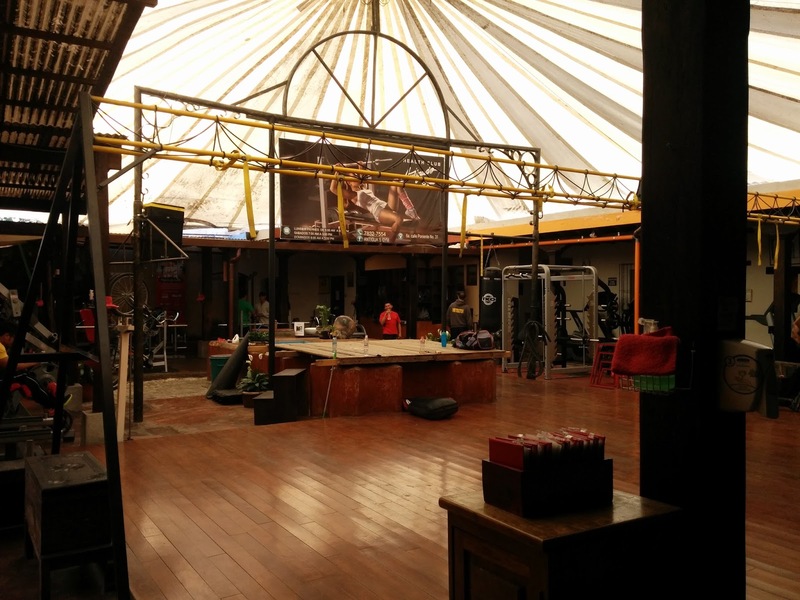 I love the outdoor feel of Antigua's gym. It is only empty like this is in the morning before the rush. Another real aspect of our week is going the gym. Many locals go to the gym and observing them for the last three weeks, I can say that both men and women take their workouts very seriously. They sweat. They dress properly for the gym. They work hard and exert the maximum effort they can. (The male kickboxing teacher kind of scares me). Pushing yourself hard is the gym's standard atmosphere. No machine is ever idle and though some people are clearly standing around flirting, this is usually after their work out not instead of it. This gym scene is in stark contrast to the Italian one I lived where I could only conclude that the majority of Roman gym-goers wanted to work out only secondarily to wanting to socialize: either to each other, the trainers or on their cell phones. If they did end up doing exercise, it was only to the extent that it didn’t mess with their outfit, makeup or look in general. Sweating is bad. Exertion is unnecessary. And contrary to here where the gym is essentially outdoors allowing a nice breeze through the slits of the tent-like roof, in Rome, windows are usually closed because drafts are dangerous. Fans are non-existent and air conditioning can outright kill you. for their love towards these stray pooches. I also realized that I can’t think of Antigua like a city, at least not a city like Rome, DC or Montreal. Antigua is an old historic center that keeps its charm because of the limits imposed on in, but that means that it is a city by ancient standards, not modern ones. Antigua is more a community than a city. But it is an active one for locals and (some) foreigners alike. There is a volunteer group for almost every issue: literacy, health, housing, stray animals etc. 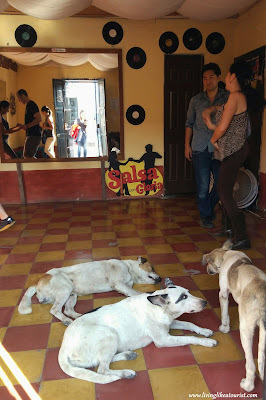 Our salsa teacher’s studio for example almost doubles as a shelter for the stray dogs that have realized that she is a kind, reliable and giving human who always has a bowl of water and one of food available to them. She asks her students to contribute 1 pound of food if they can to this cause, which we happily do. We go to mass on Sundays and it is easy to see that the church, whether you go or not, is a huge part of life here. Churches are bursting with parishioners at every mass. There are extra stacks of plastic chairs for the overflow. Even for those who do not attend, I think the church is still a part of their life as a willful absence. Churches are not ignored here. 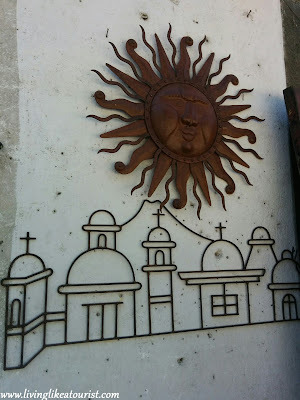 Religion is not irrelevant like in many neighborhoods in the world, even I dare say Rome. Here, everyone goes to church so if you don’t go, people know you didn’t go and you know you didn’t go. It is not, from what I can tell, the culture of shame anymore, but it is the culture of concern and you can bet that people are praying for you to have a change of heart. 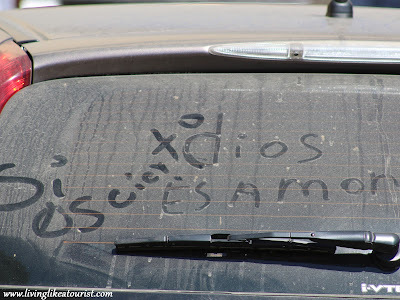 Most city-organized events are religious, and even buses and trucks are adorned with testimonials to God. Just like in Italy, food is a huge part of life. Shopping for it, cooking it, eating it as a family, sharing it, cleaning up after it: food makes up at least 50% of our conversations at school. Echoes of Italy ring in my ear with each discussion, though I replace the words Amatriciana or Carbonara with Tamalitos or Pepian. Grocery shopping is a real part of living in anywhere. 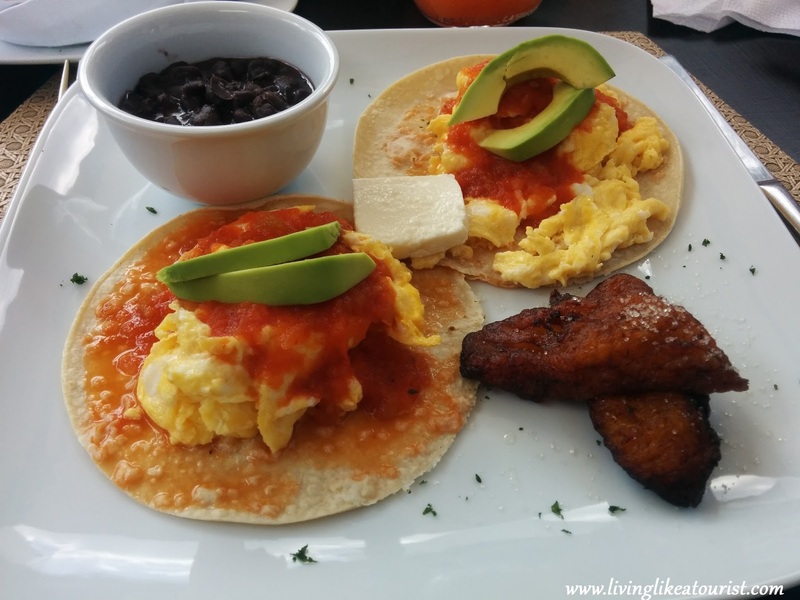 In Antigua, there are only two grocery stores and unfortunately, they are overwhelming filled with junk food. Like in most places, junk food here is much cheaper than good food. Cereal, juice, jam, peanut butter, oil, bread, crackers, cheese: you need to scan the labels carefully to understand what its contents really are. Anything that is not filled with chemicals and sugar is usually about 3x the price of its faux alternative. This is clearly the influence of the US, but it is particularly upsetting because you know that the salaries of the vast majority of people make it so that the good alternative is not really an alternative. Paying 6 USD for juice just because it has no added sugar is usually the luxury of a foreigner. Some other observations: Everyone has a cell phone, usually a smart one. Selfies are popular. PDA is not a bad word or concept here. 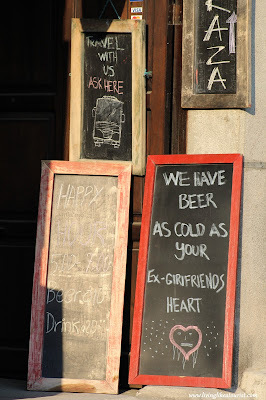 Beer is equally popular with women as with men. Politeness is a big part of the culture and is included in the way people to speak to each other, locals and foreigners alike. Con permisso and para servirle are some of the most common phrases. Pinatas are actually very popular and accompany many celebrations. Kids are one of the most important things you can have in life, but they are also a big source of economic difficulty for people who struggle to get by with the income they have.With its first female mayor just in office this month, Antiguans are excited for change. But if you don’t want to, you don’t have to see this Antigua. 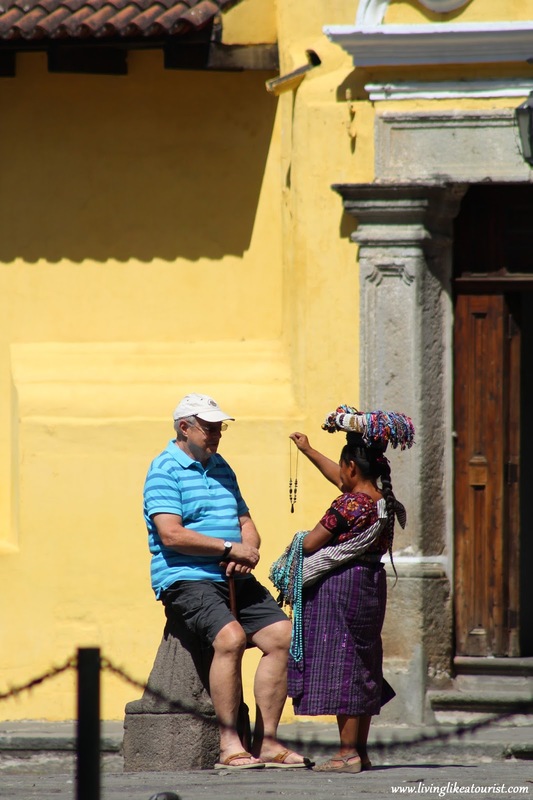 If you want to come to Camp Guatemala where the beer is cheap and your Spanish is an adornment not a necessity, you can have that experience too. You can eat sushi, go to yoga, eat bagels for breakfast and hamburgers for dinner and never be the wiser. There are enough foreign restaurants, bars, hostels, tourists and tour groups to shelter you from the full reality of this little city. Antigua has a bit of everything, so you can do as you want here, but me, I already know how I would choose. 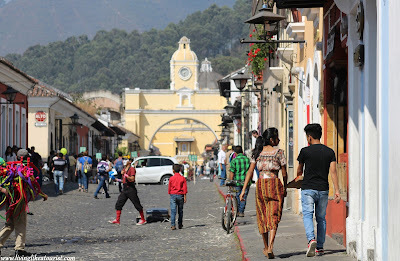 We have been here in Antigua Guatemala for a little over a week and what a full week it has been. I have joined a semi-outdoor gym, run to the next pueblo over, eaten my weight in aguacates (avocados), learned how to make Mayan chocolate, bought papaya and bananitos at the market, and purified raw fruits and vegetables with a solution that is likely more harmful to my health than any bacteria hidden on the fruits itself. Making chocolate powder. Everyone agreed, I am terrible at it. 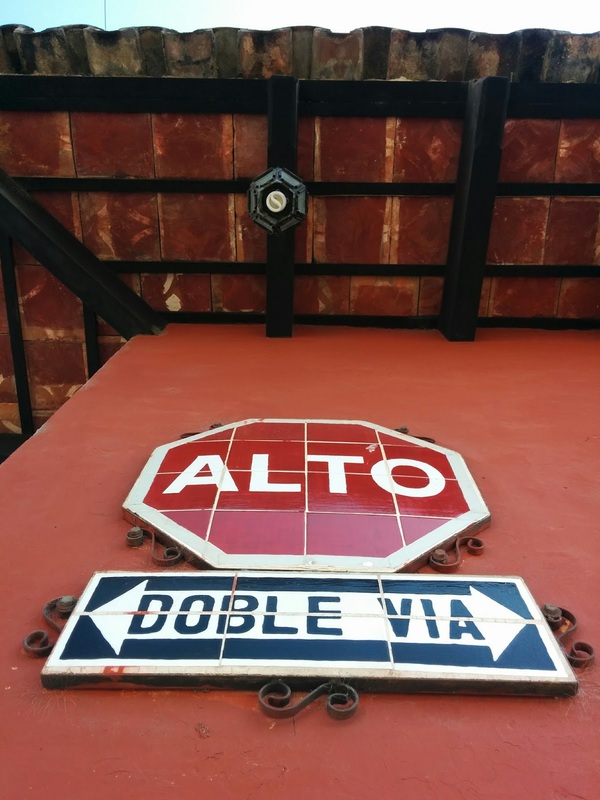 We have taken a chicken bus to a small town (San Juan del Obispo) and a zippy, bumpy, rickety tuk-tuk back to our slightly far, but charmingly convenient apartment. We have learned some new moves, and improved some old ones, in one group and one private salsa class. And most importantly, 40 hours later, I have learned the present, past and imperfect tense of Spanish and the meaning of words like madrugada (early morning), hiciste (you did) and albondegas (meatballs), random words that have floated around in my head for years, most likely thanks to a J. Lo or Ricky Martin song... I am sorry to admit. The weather here is perfect: 75/24 degrees, every day, cloudy or sunny, and it has yet to rain. You can wear open-toed shoes with a button-down sweater and be entirely comfortable. They call Guatemala the “land of the eternal spring”. To me, this is what the temperature in heaven must be like. The people we have met here are some of the most polite and nicest I have met anywhere. Canada has competition. And thankfully, the Spanish spoken here is very clear and easy to understand (perhaps a useful outcome of mass tourism?). We have bought an exprimador (squeezer) for lemons and a separate one for garlic. Our fridge is filled with local favorites: limas (limes), cebollas (onions), ajo (garlic), queso fresco (fresh cheese), the local favorite beer Gallo, and fruits whose English names mean nothing to me: loquats (in Spanish nispero), a type of fruit like a sourer apricot and sapodilla (zapota in Spanish) a fruit that strangely enough tastes like pumpkin pie. 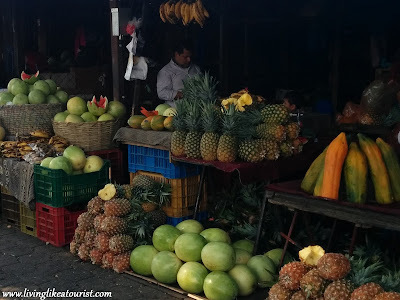 These market fruits I know. Most I do not. 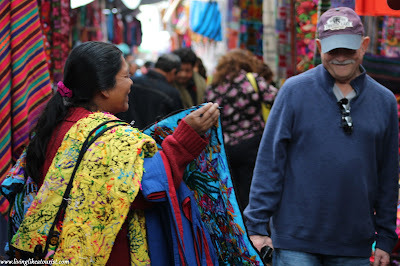 Thanks to my husband’s multiple visits and chatty personality, we regularly run into people we know in the streets. 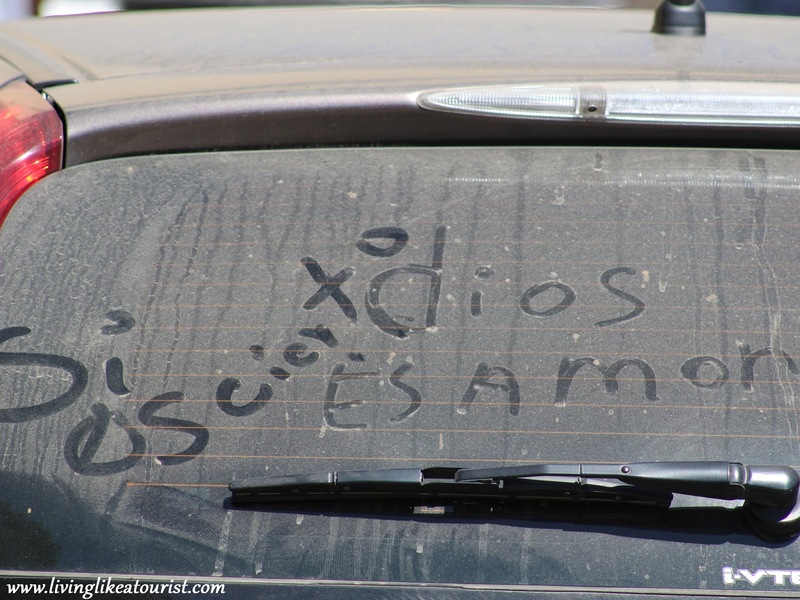 We are locals to the extent that light-skinned, debutante Spanish speakers can be. But for the price we are paying for our apartment, or for pretty much anything we buy at the markets and restaurants, we are definitely not locals. Nor are we expats. As is our MO, we are tourists, but ones who like to live in the countries we visit. As people living here, I still need some time to understand Antigua; its outer layers are filled with scenic photos, organized tours and tourism talk. I want to pull away some of the glossiness and see the place for itself. Hopefully, my next post will convey my findings. As a plain tourist though, it is easy to see why Antigua’s popularity is growing. 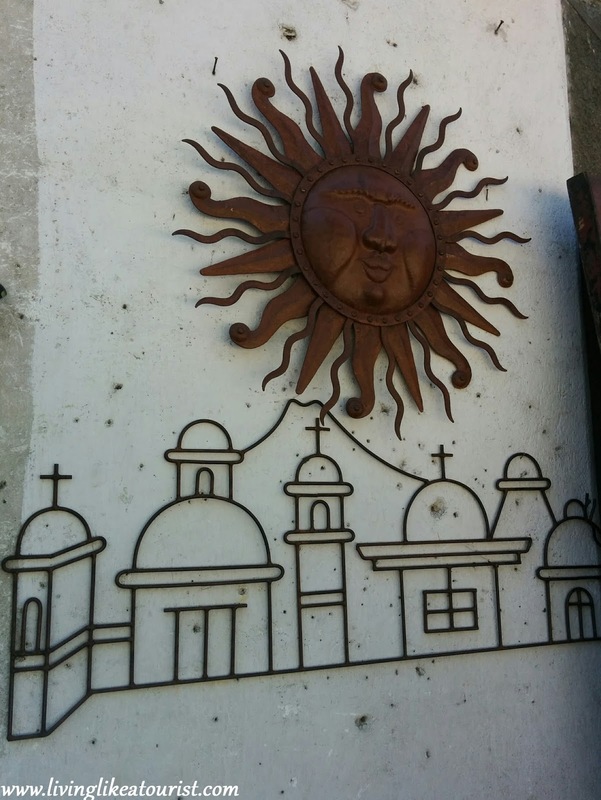 La Antigua Guatemala is certainly charming. I didn't know it, but the word for that little lever that makes a train going at 200 miles an hour move from one set of tracks to a new one is appropriately called a switch. And what a switch it has been. Our train was chugging along on the UN-Italy track and could have kept on chugging. But the path hadn’t varied in a long time and we decided that rather than settle in for the long haul on a well-known, well-traversed path, we could pull the switch, divert the train and see what happens. Down the road the tracks may meet up again, but at least along the way, we see different scenery. December 1, we pulled the railroad switch and set ourselves on a different track. We decided to go to Guatemala for a month to learn the Spanish that we would use for the rest of our travels through Central and South America: first Panama, Costa Rica and Nicaragua to be followed by Colombia, Argentina, Chile and Peru. As our savings dwindle, hopefully our creativity, opportunities and horizons will expand. Everything else that happens along the way, we cannot predict. For me, this trip is also an important exercise in not having a goal, not having a broader plan, not having a deeper reason for this experience. It is killing me not to analyze and dissect this decision for its greater significance, and not to know whether the end will justify the means. This is an exercise in the letting the means justify the means and I am doing my best to take it as it comes: the journey not the destination. This test of self-defiance and restraint is already a tough one which usually means it is a worthwhile one. So after dragging out my goodbye to Italy, shipping every possession across the Atlantic and agonizing over leaving my kitty with my parents, I stepped off the Delta aircraft into Guatemala City's small but increasingly busy airport and left my fears behind on the airplane between the in-flight magazine and the safety instructions card. I was here. I was doing it. There is not enough space in our heads to both live life to the fullest and be apprehensive. Living like a tourist-mode. I am after all, a pro at this. Follow me on Instagram to see our day-to-day in pictures.